Motor Control Starter Kit The MCSK provides everything needed to begin learning about sensorless BLDC motor control including digital signal controller, programmer, and a debugger. DM330018 - dsPIC33EV 5 V CAN-LIN Starter Kit Microchip's DM330018 kit features up to 6 advanced motor control PWMs, 12-bit ADC, and op amps for easy interface to 5 V automotive sensors. SMPS and Digital Power Conversion Solutions Microchip's dsPIC® digital signal controllers (DSCs) for switch mode power supplies (SMPS) and digital power conversion. MCU Solutions for White Goods Tighten Focus on Low Power, Safety Learn about microcontrollers as they relate to motor control and low power applications in white goods and the safety concerns for white good applications. Vehicle-to-Grid Gains Traction as Elastic Energy Reservoir Vehicle-to-grid (V2G) power acts as an energy store to be used as a primary source of energy for electric vehicles and plug-in hybrids. 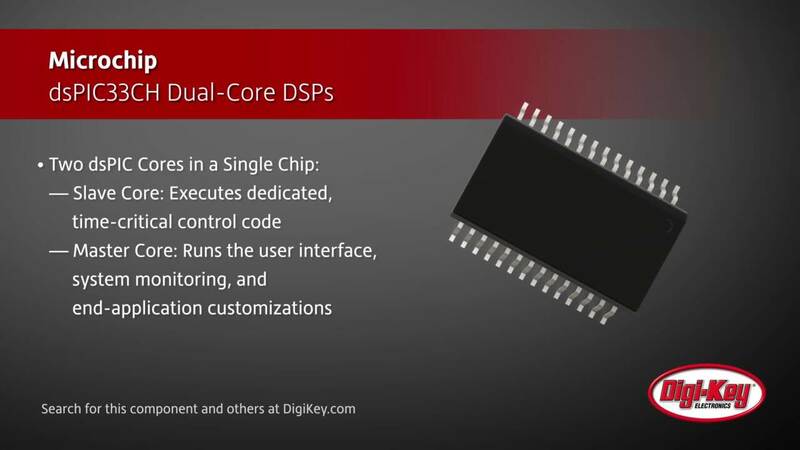 DSP-Enabled MCUs Tackle Audio and Speech Tasks Digital audio and speech is ubiquitous in products ranging from specialized industrial embedded systems to consumer products such as headsets and car kits.